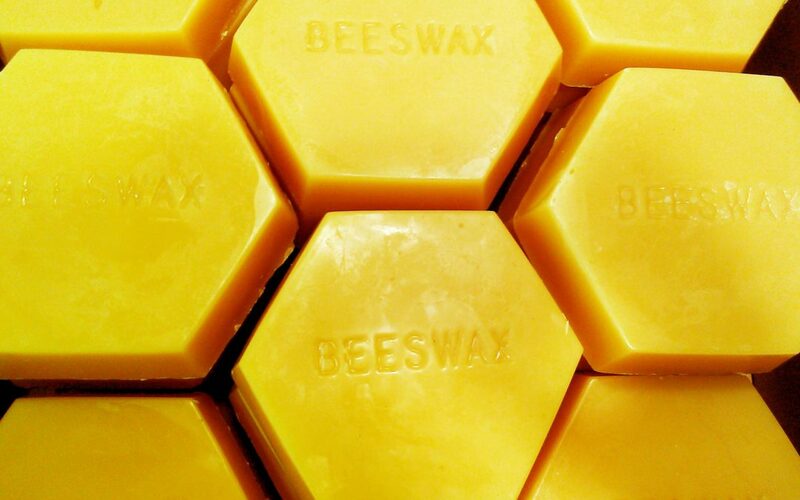 One of the main ingredients in our All Purpose Cream and our Lip Lubes is beeswax. We use it because not only does it help hold all the other ingredients together and make our cream smooth and rich, but it has lots of natural healing and antimicrobial properties itself! Plus, it smells so good. Honeybees produce a natural wax, secreting it from glands on the sides of their bodies. They then scrape the wax off, chew it up and secret it to the inside of the honeycomb. There, it gradually hardens into a protective lining for the cells where the baby bees are grown and the honey is stored. Beeswax is a natural by-product from honey production, but because most consumers don’t buy it at retail, many beekeepers sell it at a good rate, or make candles out of it. Beeswax has been widely used over the centuries for a number of reasons, most commonly to make candles, which it is still used for today. In fact, beeswax candles are thought to be healthier than most, since they don’t produce toxic byproducts and heavy soot when burned, and they also help neutralize pollutants in the air. Ancient Egyptians used beeswax to make paint for their artists, and during Roman times, it was also used as a skin softener and to encourage wound healing. Today scientists are studying beeswax for its potential to lower cholesterol, relieve pain, reduce inflammation, and treat digestive ailments. A 2007 study also found that a purified constituent of beeswax may protect liver health because of the antioxidant effects. The cosmetics industry loves beeswax because not only is it natural and non-toxic, it provides benefits to the skin and to various types of formulas. It’s a “thickening agent,” for instance, which means that it can help thicken creams to make them easier to use and more spreadable on the skin. Vitamin A: A good source of this vitamin, beeswax helps support cell turnover and reconstruction. Read: helps fix wrinkles! Fragrance: Beeswax has a natural honey fragrance, and is a favorite in soaps and perfumes because of its pleasant, light aroma. It really is one of my favorite scents. In a poetry class, I was once asked to describe it and to me it smells like home, like golden sunlight, like warmed-up flowers. Really, you should get a piece and sniff it. Wound healing: Because of its anti-inflammatory properties, beeswax has been found to help encourage the healing of wounds. Studies have even found that it may be effective against hemorrhoids. Itching: If you suffer from dry skin itching, dermatitis, eczema, or any type of itching related to a skin condition, beeswax is for you. A study published in 2012 found that those patients who suffered serious burns, and later went through “post-burn itch” when the burns were healing, experienced relief with an herbal oil cream and beeswax combination, so much so that they were able to cut back on their use of medications for the itch. Because beeswax is anti-allergenic, it is also easily tolerated by even those with reactive skin. Hair: Beeswax is also a natural treatment to stimulate hair growth. Furthermore, being a good thickening agent, beeswax helps add volume to your hair while keeping it soft, shiny, and more manageable. It is also beneficial in protecting the hair from environmental damage. Beeswax is therefore commonly used in hair care products like shampoos, conditioners, balms, pomades, emulsifiers, and products for hair repair. Beeswax is a natural, safe, and hypoallergenic ingredient to use on both the hair as well as the scalp to add strength, luster, and volume to the hair. Sturdy Girl sources our beeswax from Treasure State Honey in Fort Shaw, Montana. We love them because they’re a family owned business that’s committed to processing their honey and beeswax as minimally as possible, which means more of the good stuff stays in the final products!